Come celebrate Labor Day with Brian and Brendan together with Henry the Fiddler at The Taste of Colorado at 3:15 pm on the Heritage Stage (close to Colfax and Broadway in Civic Center Park). Come celebrate Labor Day with Brian and Brendan together with Henry the Fiddler at The Taste of Colorado at 3:15 pm Monday, September 4th on the Heritage Stage (close to Colfax and Broadway in Civic Center Park). We will be playing two sets--until 5:30 pm on Monday. There's plenty of the areas very best food offerings, together with neat vendors and booths, a variety of stages, and it's all FREE to the public. The event features a lot of distinctive bands; America will play on the main stage right after our second set. Note that the band is going by the shortened name of Irish Row for this and some other upcoming events. You can find out more about Taste of Colorado by clicking here or on the logo above. Join us in our first appearance..again as Irish Row...when we appear in one of Colorado's best-know outdoor events, The Summerset Festival, Sunday, September 17, 2006 at 2 pm. We'll do two sets on the main stage, shown at left, in Clement Park. Many of you are familiar with the park--it's also used by the Colorado Irish Festival. Summerset is a terrific, FREE event that runs both Saturday the 16th and Sunday, and features lots of music, a car show, a really neat hot air balloon festival, a wild and wooly dog show and even a fishing derby for the kids. Visit their web site for more information, or click on the photo above. The Irish Snug at 1201 East Colfax on Capitol Hill is hosting a benefit for the AOH, Emerald Society and Denver Gaels at the Pub from noon till we finish playing on Saturday, September 9th. Admission is free, there will be a raffle and appearances by member pipe and drum groups throughout the day. The music line-up is varied--and terrific. It includes a popular young group, The Commoners starting at noon; Riverrun follows at 2:45 pm--they are a new group with some well-known session musicians and a new lead vocalist; this group is poised to become a local phenomenon, and this is their first public appearance. At 5:30 pm, Hunker Down will offer a very entertaining wide range of Bluegrass music, with lots of other styles thrown in. This is a not-to-be-missed group! Louise Connolly will make an appearance during the afternoon. See the next panel for details. The Reed School of Irish Dance will perform a full show with Championship-level Irish Stepdancers at 8 pm. 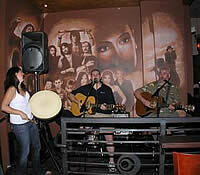 This is a great Irish dance group that performs regularly at the Irish Snug. Irish Row will start at 8:30 pm, featuring the entire band. We'll play until 12:30. If this doesn't get you ready for St. Patrick's Day, nothing will! Mid-afternoon on Sunday, September 9thy at the Irish Snug's Six Months to St. Patrick's Day Fundraiser will feature a performance by Louise Connolly, certainly one of the best Irish Step dancers in the World. By the age of 12 she already had earned herself the title of World Champion, twice, as well as Ulster Provincial, All-Ireland, All- Scottish, and British National Champion. At the age of 17, she hung up her competitive shoes and took her dancing career to the next level. She began dancing professionally, touring with the world-renowned show, Michael Flatley’s “Lord of the Dance”. By eighteen she was given the lead role of “Saoirse” and continued touring the world for almost 7 years. She has just started an Irish Stepdancing Academy in the Denver area and anyone looking for the best dance school for their son or daughter should not miss this performance and the chance to talk to Louise following her short show. I have seen a lot of Irish dancers in Colorado, folks, and Louise Connolly is absolutely in the stratosphere above anything you have seen in a local performance! Don't miss it! New Galleries have been added that you can view here. They include some pictures of the new renovation at Fadó Irish Pub and recent photos from a Thursday Night at Jack Quinn...if you're not in one of our galleries, come down to the pub on Wednesday, Thursday or Saturday Night and get in one!!! Jack Quinn Irish Alehouse and Pub in Colorado Springs will be the repast headquarters of the International Association of Fire Fighters during the week of September 10-16th as they gather to honor the Fallen Fire Fighters at the Memorial in Colorado Springs. Jack Quinn will also host an Oyster Festival during September. Check the pub web site for further details...Brian performs at Jack Quinn every Thursday night at 7:30 pm, and Thursday, September 12th should be a memorable evening as we salute the Fire Fighters of America and enjoy an evening of Irish Ballads and Pub Songs. The Irish Snug has some exciting happenings with a Six Month to St. Patrick's Day celebration coming up next weekend (September 9-all day long-see "6 to St. Pat's" tab above. In addition, well, there's a new addition underway. 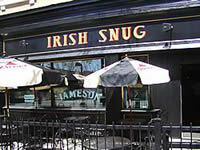 The entire basement of the Bourbon Building is being renovate to triple the space of the Irish Snug.